Babylonia, the makers of the BB Tai, are veterans in the baby carrier industry. This Belgium brand has been around for 16 years, making quality woven wraps, ring slings, stretchies, and Meh Dai’s. They recently sent me a BB Tai (their version of a Wrap Conversion Meh Dai) to review, and honestly both my partner and I have been wearing it nonstop. 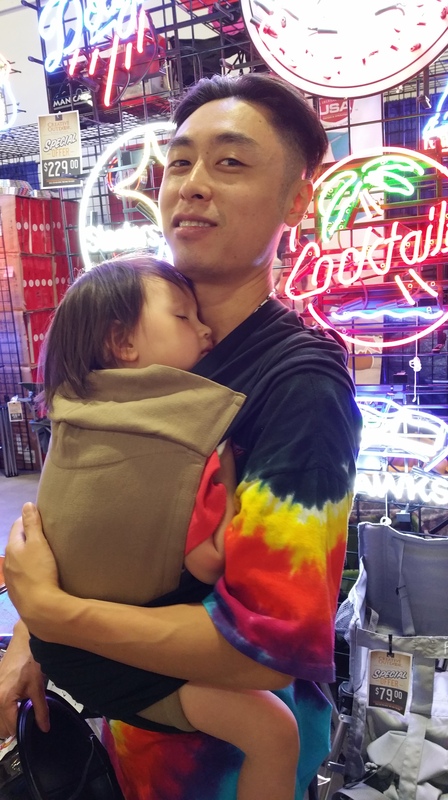 I have a pile of woven wrap testers here right now, and the BB Tai has been the carrier I have been grabbing every time we head out the door. It is no secret that I am a huge fan of Meh Dai’s. They are versatile and adjustable for use with a newborn, through the toddler stage. 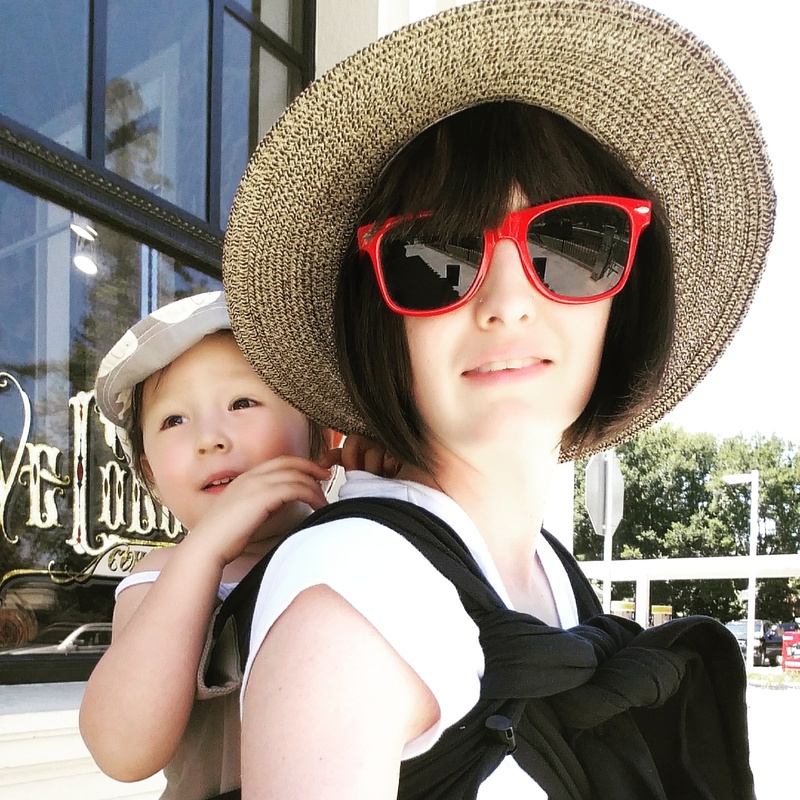 They are the one of the few carriers that I would recommend to a family looking for “one carrier” to get them through their babywearing years – they are an affordable, ergonomic, easy to use babywearing device for anyone interested in using such a thing. The BB Tai ups the ante on some of the other carriers in this category (Infantino :cough cough: ), by producing their products with organizations that are members of the International Federation for Fair Trade (IFAT), and utilizing 100% organic cotton for their woven materials. The carrier itself is so beautiful in its simplicity. It has wrap style straps, with pleating on the shoulders. 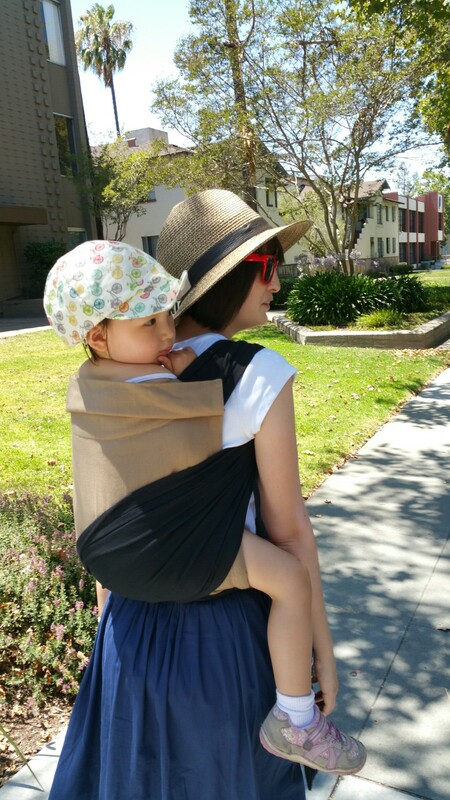 There is no padding, which makes for a very sleek looking carrier, but the weight is very well distributed with even the heaviest toddler by the wide wrap straps. The other day we went to a parade, and unintentionally ended up walking a few miles from our car with our toddler in the 90 degree heat of July. The way back we really put the BB Tai to the test, wearing an exhausted 30lb Dragon Baby the few miles back to the car in the hot hot sun. 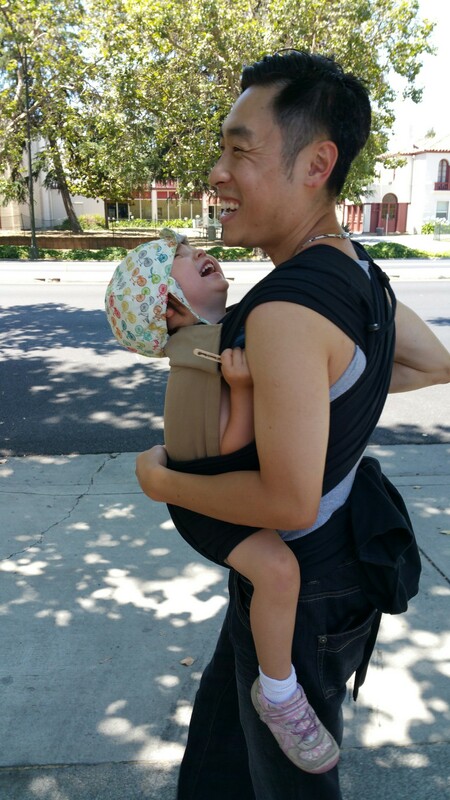 Besides being pleasantly surprised at how breathable and soft the woven fabric was for the summer temperatures, I was also happy to find that the carrier was incredibly supportive and comfortable for use with a giant toddler! I was able to use the wrap straps to provide adequate knee-to-knee coverage for her, providing additional comfort to my back as well. The head rest is adjustable, which made it tall enough for my three year old, but also it was able to adjust to fit a newborn and provide adequate support for their floppy little heads. Speaking of newborns, the BB Tai has this cool little woven insert that uses Velcro to attach to the inside panel of the carrier, acting as an infant insert for a smaller baby. It is fool proof to use, which is one of the things I find most appealing about this particular insert for a first time wearer. Unlike many of the other carriers with infant inserts on the market, this one is not bulky and will not lead to overheating, it fits in just like it was a part of the carrier to begin with, but can easily be removed when you no longer need it. The BB Tai came in a cute little bag, made of the same woven fabric as the carrier. The carrier fit easily into the bag, leaving room for a few other things like keys, wallet, cell phone, and a diaper or two. It even had a smaller zipper pocket on the outside to keep the keys separate from your beloved carrier. 😉 It was such a nice addition, and is likely one of the major reasons that we keep reaching for this carrier over others when we head out the door. BB Tai has all the sleepy dust! We’ve had like 5 naps in the last week. The BB Tai does not come in a lot of flashy colors or prints, but I am into neutral colors in general, so I find that appealing. It has a classy look to it, and can easily be dressed up or down depending on the occasion. And at $109 retail, you can feel just as comfortable taking it hiking as you would wearing it to a more formal occasion. This carrier is a fantastic addition to anyone’s stash! A great gift for a first time parent, or a nice transition for someone looking to move beyond a Soft Structure Carrier but still weary of the woven wraps. This is a tried and true budget carrier suitable for any wearer. Which one do you think would better support a toddler: BB tai or the Fidella fly tai? I noticed that you reviewed both. Thank you for your help. Tough call! They both would work fine because of the wrap style straps. I tend to grab for my BBTAI more though, because the woven fabric is more grippy (rather than the Fidella wrap fabric is slippery). I find the grip easier to keep taut when wrapping a bigger child. Thanks for reviewing this. Is there a way to make the seat narrower? Or would it not be a problem with a 3 month old? I’m concerned that the seat on this mei tai is too wide for my little one. I have just one more question. Which type of straps are easier on the shoulders—BB Tai or Fly Tai. One has padding, the other does not. I also noticed from the pictures that sometimes the BB Tai unpadded straps are worn spread out on the shoulder and sometimes scrunched up on the shoulder which helps avoid loss of arm mobility. Do both ways provide similar comfort? I don’t always want to spread the fabric over my shoulder cap to allow for more movement in the arm. Thank you for you help. I personally prefer the straps on the BB Tai which are not as bulky… but I feel like if you don’t spread them you will miss out on a lot of the appeal of those straps specifically. So in that case, you may prefer the FlyTai straps because the padding will be comfy regardless of whether it’s spread or not. Very helpful review. I would like to ask how it feels around the abdomen? Unfortunately I have developed prolapse but do not want to give up babywearing so looking for the most suitable solution. Any advice would be appreciated. Many thanks!